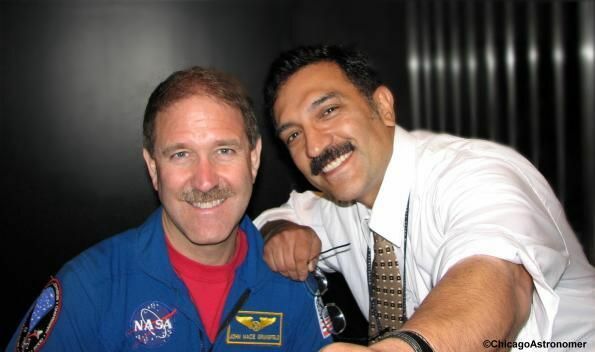 I had the great pleasure and opportunity to meet and briefly talk with STS-125 Shuttle Astronaut John Grunsfeld at the Adler Planetarium this day. 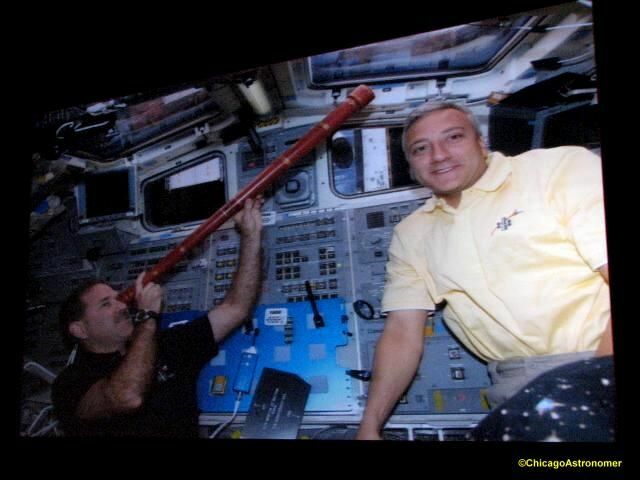 This was his first stop since his returning home from the Great Hubble repair mission last month and he presented us with an interesting slide and movie show of the flight. 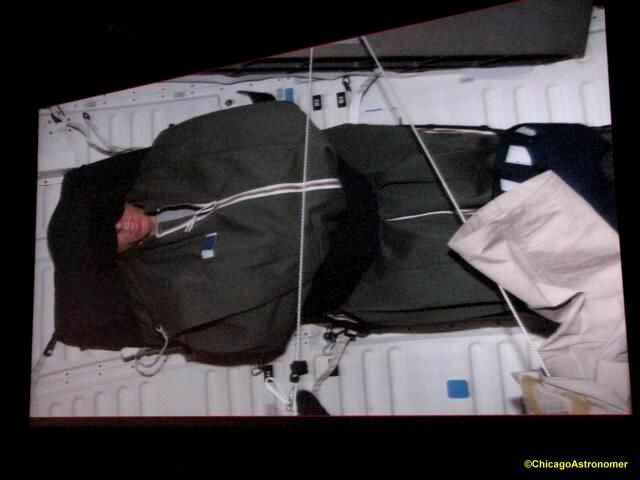 Explaining his experiences in zero gravity and preparation for the EVA, here he shows how Astronauts sleep, binded tightly against a wall, eyes covered and ears plugged. 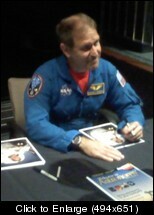 He said he loved sleeping in space, and as he has been on several Shuttle flights now, it's very calming. 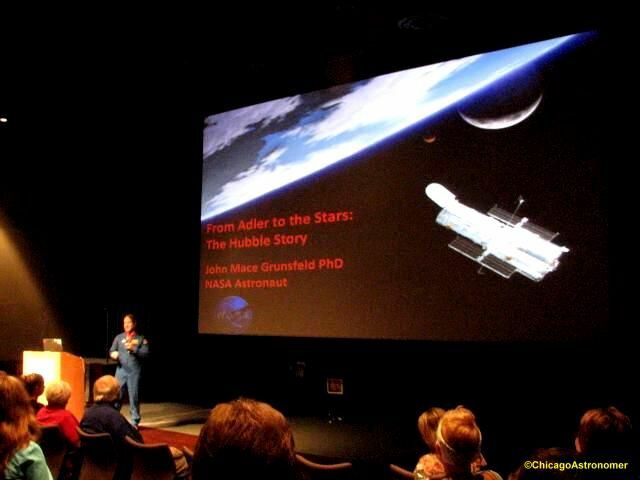 Grunsfeld explained that the Hubble is better than new now...with brand new optics, gyros and other upgrades. Even a docking port was installed for future spacecraft to attend to the Hubble...either to repair, hoist to higher orbit or other attentions. Items that were never intended to to be replaced were wrestled out and this was the first mission in space that metal was cut away to access the internal componants...very dangerous. The batteries were replaced and after 19 years,still working! The packs are recharged & recycled every 90 minutes as the Hubble orbits the Earth. The battery pack container is about the size of a small fridge. As this required many EVA's, endurance of both astronauts and equipment were stretched. 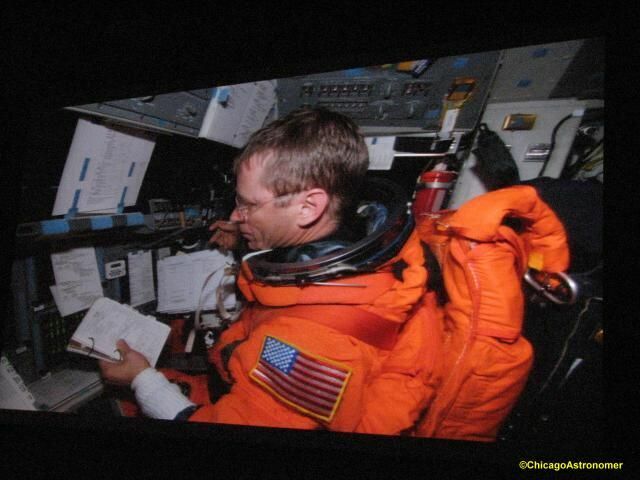 In prior EVA missions, fingers were getting dangerously cold...as the the temps swing wildly from +200 to -200 degrees Fahrenheit. Gloves are now fitted with small metal heaters in the gloves to keep the space chill out. Interesting was the removal of the "Corrective Lenses" that were installed to fix the Hubble's myopia when first operated. 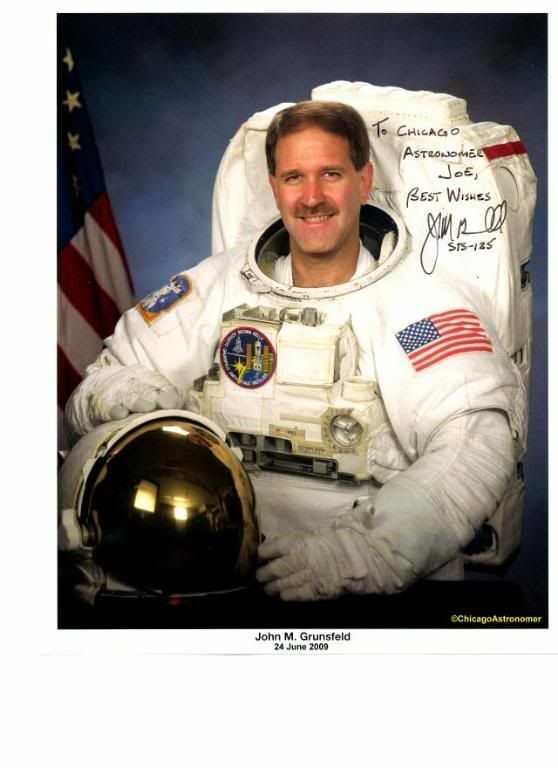 In it's place, the astronauts installed sophisticated imaging equipment. We will know in about a month from now if the Hubble "Works"...or not. First was a faithful reproduction of Galileo's telescope in recognition of the 400th Anniversary of the telescope in astronomy. Too long to stow, they were forced to cut it in half and installed coupling threads. 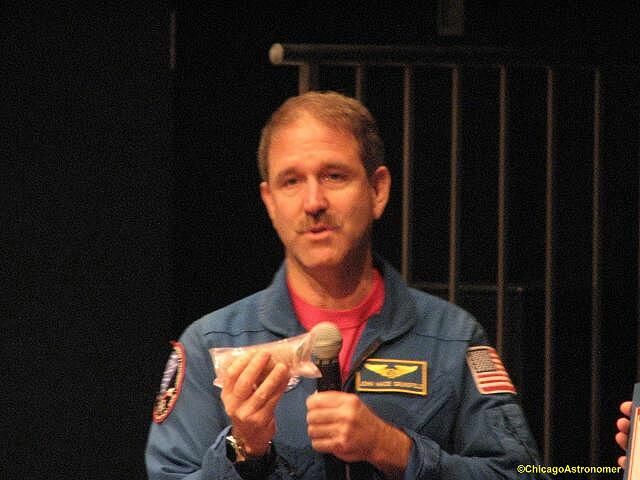 The Adler has a running program of launching weather-type balloons thousands of feet up called the "Far Horizons Mission"...and on one flight, they strapped a Peep as a space sugary confection. Here, the crew goes through the checklist before re-entry..
Pictured are Adler Facilitators Nick, Jude and myself. For the Easter holiday, I was going to give you a Peeps treat. 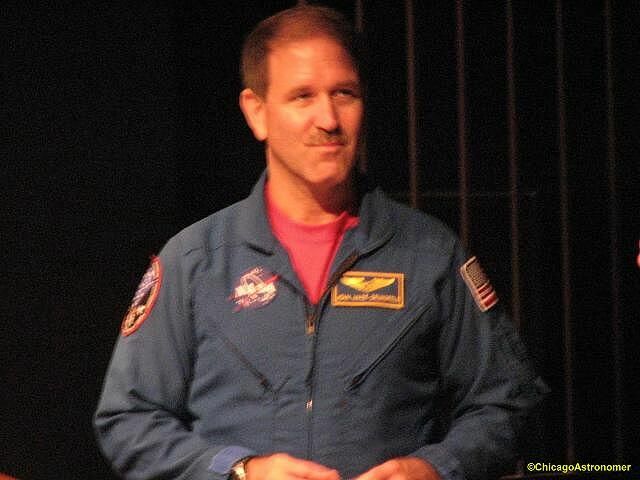 I have audio from this session of John Grunsfeld talking about Adler asking him to take Peeps aboard Atlantis for the STS-125 mission. They did not survive to re-entry. The file I have is a Wave Sound file, and with the Windows changes to Movie Maker Live, I can't seem to convert it to a video file, or edit it to the 3:04 of the more than an hour long file that Michelle Nichols and Grunsfeld talk about Peeps in Space. 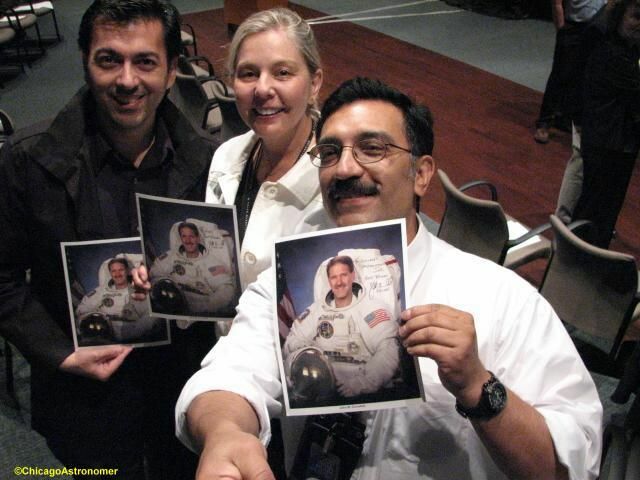 In the meantime, check out these pics of Peeps Astronauts in training. 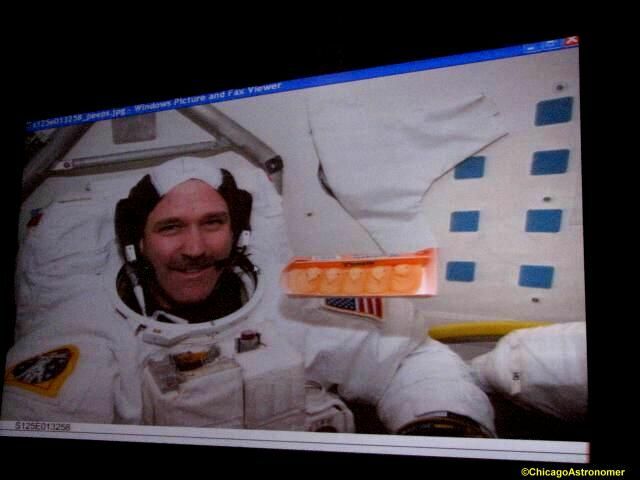 Grunsfeld didn't elaborate on whether or not Peeps taste better in space, but I suspect they do. It's a free audio media editor download that will do what you want. You'll also need to download the LAME plug-in, but the site will detail what you need to do. I use Audacity all the time. Downloading now. Unsure whether I will get this done before going to bed. Been up for 30 hours now. Come the 1st of June...you'll be so hyped up - 30 hours will seem like nothing!